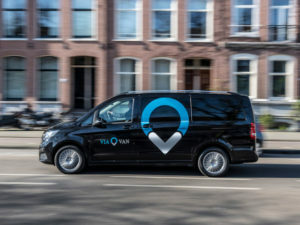 Mercedes-Benz Vans and US technology start-up Via have launched their on-demand ridesharing ViaVan joint venture in London as part of its ongoing roll-out in Europe. The service is powered by Via’s dynamic ride-pooling technology, which was developed initially for New York City. Introduced just a few weeks after the scheme marked its European debut in Amsterdam, the service provides a fleet of Mercedes-Benz vans to offer shared rides that can be booked via an app, covering zones 1 and 2 in central London, for an introductory price of £3. Drivers are then guided to a nearby, virtual stop where they are then picked up by a professional driver, using intelligent route planning to ensure an efficient service with minimum delays. Riders and drivers will also benefit from 24/7 real-time support. Other cities, including Berlin, will follow as soon as the required permits are obtained.